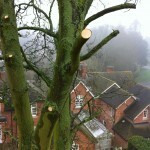 Tree Care Services - Hill-fort Ltd.
Pollarding, carried out very soon after tree establishment, is the removal of all or most branches, usually at a height of 2-3m and is maintained by cyclical re-cutting. 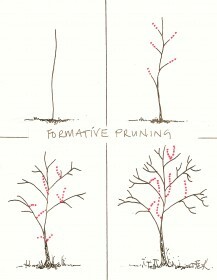 Formative pruning is the removal of selected branches aimed at producing a tree which in maturity will be free from major physical weaknesses. 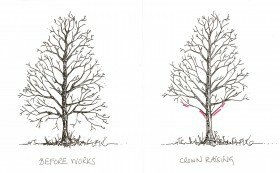 A procedure by which a percentage of the live branches are removed evenly throughout the tree, so that the tree retains its original shape, but appears less dense. Usually epressed as a percentage. Removal of the lowest part of the crown to an agreed height. Normally this is to give more light and a more uniform appearance, also to accommodate buildings, highways or access beneath the tree. This refers to branches close to buildings or service wires. 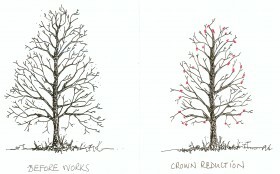 Branches are normally removed to clear service wires in all directions by at least 1 m, and to clear building walls by at least 2 m where possible. Where branches are extending over buildings they are cut to clear the roof level by at least 3 m, or as specified. The tree is either felled or dismantled in sections and disposed of as directed. 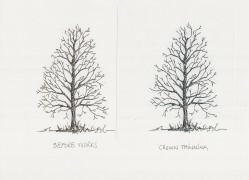 The main stump of the tree is left in the ground and cut off as close to soil level as possible without further digging. 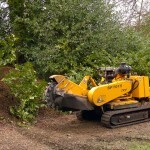 The main stump of the tree is ground into chips with a special machine to a minimum depth of 0.2 m below the present soil level over the width of the trunk cross section. Smaller roots spreading out from the main stump are left undisturbed in the soil. The chip/soil mixture is left tidy at the position of the original stump unless otherwise agreed.